The CD4+CD25+ regulatory T (TR)4 cells are a unique population of T cells that maintain peripheral immune tolerance and inhibit autoreactive T cells (1, 2, 3). Although T cells with regulatory or suppressive properties are not strictly confined to the CD4+CD25+ T cell compartment, TR cells are now well characterized in both mice and humans and play an important role in various clinical conditions. TR cells inhibit alloreactive T cells and suppress transplant rejection reactions, and the role of TR cells in cancer and chronic infectious diseases is a subject of intense investigation (4). Through in vitro experiments, TR cells are shown to effectively inhibit effector T cell responses such as cytokine production and proliferation (5). At least two subpopulations of TR cells exist named naturally occurring TR (TRnat) cells and adaptive TR (TRadapt) cells (4, 6). The lineage relationship between these two subsets remains unclear. In mice, TRnat cells are generated in the thymus by recognizing self-peptides with high avidity yet escaping negative selection (7). TRnat cells play a crucial function in the normal immune system by suppressing autoreactive T cells and maintaining immune tolerance; however, suppressive TR cells also inhibit immune responses directed against infectious agents and neoplasms. Although TR cells suppress responding T cells in an Ag-nonspecific manner, TR cells need to be activated through the TCR to achieve suppressive activity (8). Thus, it is likely that TR cells specific for foreign Ags, termed TRadapt cells, are of extrathymic origin and generated in the periphery from the peripheral T cell repertoire. The possibility that TR cells can be generated in the periphery is supported by several in vitro and in vivo models demonstrating the induction of TRadapt cells from CD25− T cells by prolonged or repeated antigenic stimulation (9, 10). Alternatively, differentiation of TRadapt cells can be induced by IL-10 or TGF-β (11, 12). However, it is still not determined whether TRnat and TRadapt cells represent distinct lineages or just phenotypic variants induced at different anatomical sites. The transcription factor FOXP3 that is essential for the suppressive activity of TRnat cells was, in mouse models, initially thought to be a specific marker of TRnat cells that could not be induced in activated peripheral T cells (13, 14, 15). However, later studies have demonstrated induction of FOXP3 expression in TRadapt cells in both in vitro and in vivo models (16, 17, 18, 19, 20). The mechanism of suppression of T effector cells by TR cells is not fully known. Transwell experiments support a contact-dependent mechanism for TRnat cells, although a short-range humoral factor with limited water solubility cannot be ruled out. A role for IL-10, TGF-β, and CTLA-4 have been demonstrated for both TRnat cells and TRadapt cells, but it is not finally determined whether these factors primarily play a role in the differentiation process or in the suppressive activity (3). PGs have strong immunomodulatory activity within the immune system and can have both systemic and short-range autocrine and paracrine effects (21). PGE2 binds to the G protein-coupled receptors EP2 and EP4 and effectively suppress T cell immune responses by eliciting a cAMP (protein kinase A) Csk inhibitory pathway localized to lipid rafts (22, 23, 24, 25, 26, 27, 28, 29). We have recently described the role of PGE2 in a mouse model for retroviral-induced immunodeficiency syndrome (MAIDS) (30), and PGE2 also suppresses autoimmune manifestations and allograft rejections in mouse and human studies (23, 31, 32, 33). Within the immune system, cyclooxygenase type 2 (COX-2) is induced during inflammatory reactions and is responsible for production of PGs and thromboxanes from arachidonic acid. COX-2 is primarily expressed in activated monocytes and macrophages (34), although COX-2 expression is also induced in activated T cells (35). In MAIDS, activated B and T cells express high levels of COX-2 (30). COX-2 expression and production of PGE2 therefore represent a putative mechanism for the inhibitory action of TRadapt cells induced in the periphery during an inflammatory response such as continuous antigenic stimulation by chronic infectious agents or neoplasms. In this study, we demonstrate that CD4+CD25− T cells can develop into FOXP3+CD4+CD25+ TRadapt cells in vitro with an equivalent suppressive potential as TRnat cells by continuous polyclonal activation with staphylococcal enterotoxin B (SEB) or anti-CD3/anti-CD28. During the differentiation process, the TRadapt cells started to express COX-2 and produce PGE2. Interestingly, neither resting nor activated TRnat cells expressed COX-2. Recently, it has been demonstrated that PGE2 can induce FOXP3+ T cells with immunoregulatory properties (36, 37). However, it has not been shown previously that TRadapt cells are COX-2 positive and can be a source of PGE2. The PGE2 production from TRadapt cells could be fully suppressed by the COX inhibitor indomethacin and by COX-2-specific inhibitor. The TRadapt cells also produced significant amounts of IL-10 and TGF-β, but the inhibitory activity of the TRadapt cells was not dependent on either cytokine. In contrast, COX inhibitors and EP-receptor antagonists reversed the inhibitory action of the TRadapt cells in most experiments. Furthermore, PGE2 induced FOXP3 expression in resting CD25− T cells. We conclude that COX-2-dependent PGE2 production represents the immunosuppressive mechanism for TRadapt cells in this model, and that FOXP3 is induced in an autocrine fashion by PGE2. These results demonstrate a new mechanism of immunosuppression by TRadapt cells. PGE2 (Sigma-Aldrich) and the COX inhibitor indomethacin (Sigma-Aldrich) were dissolved in ethanol. Butaprost methyl ester (Cayman Chemical) was dissolved in methyl acetate. 8-CPT-cAMP (Sigma-Aldrich) and IL-2 (R&D Systems) were dissolved in water. The COX-2-specific inhibitor SC58125 (Cayman Chemical), the EP2 receptor antagonist AH6809 (Cayman Chemical), and the EP4 receptor antagonist AH23848 (Sigma-Aldrich) were dissolved in DMSO. Anti-IL-10 (R&D Systems), anti-TGF-β1, -2, -3 (R&D Systems), and IL-7 (R&D Systems) were dissolved in PBS. Vehicle was used as control in all experiments. CFSE (Sigma-Aldrich) was dissolved in DMSO. Human peripheral blood was obtained from normal healthy donors (Ullevaal University Hospital Blood Center, Oslo, Norway), and PBMC were isolated by Isopaque-Ficoll (Lymphoprep; Nycomed) gradient centrifugation. CD4+CD25+ T cells were isolated using a CD4+CD25+ TR cell isolation kit according to the manufacturer’s manual (Miltenyi Biotec). Briefly, CD4+ T cells were isolated from PBMC by depletion of cells expressing CD8, CD14, CD16, CD19, CD36, CD56, CD123, TCRγδ, and Glycophorin A using a Biotin-Antibody Cocktail. Next, Anti-Biotin MicroBeads were added, and after incubation and washing, the cells were subjected to a magnetic MACS Column (Miltenyi Biotec). The CD4+ T cell fraction was collected and separated into a CD25+ and a CD25− fraction by using CD25 MicroBeads and magnetic separation on a MACS Column. The cells were routinely analyzed by flow cytometry, and the purity of the CD4+CD25+ and CD4+CD25− T cell populations were >98%. In some experiments, CD25+ cells were depleted directly from PBMC after incubation with CD25 microbeads (Miltenyi Biotec) as described above. Cells were cultured in RPMI 1640 (Invitrogen Life Technologies) supplemented with 10% FCS, 100 U/ml penicillin/streptomycin, 1 mM sodium pyruvate, and 1/100 nonessential amino acids (complete medium). TRadapt cells were generated from PBMC depleted of CD25+ cells incubated with 2 μg/ml SEB (Sigma- Aldrich) in complete medium for 2, 4, or 7 days. In experiments where pure T cells were required, TRadapt cells were generated from CD4+CD25− T cells by incubation with soluble anti-CD3 (2.5 μg/ml) or plate-bound anti-CD3 (10 μg/ml) and soluble anti-CD28 (0.5 μg/ml) (Immunotech). At the end of the incubation period, CD4+CD25+ T cells were isolated as described above and used in additional experiments. In some experiments, 10 μg/ml anti-TGF-β1, -2, -3 was added to complete medium before activation and during generation of TRadapt cells. Monoclonal anti-CD3-ε (OKT-3) was affinity-purified from supernatants of a hybridoma cell line from American Type Culture Collection. For ELISA, supernatants from cell cultures (1 × 106 cells/ml) were collected, and concentrations of PGE2, IL-10, and TGF-β1 were assessed using ELISA (R&D Systems) according to the manufacturer’s instructions. For the TGF-β ELISA, the culture supernatant was first treated with acid to lower the pH to 2.0, which denatures latency-associated peptide and allows the detection of active TGF-β. The supernatant was then brought back to neutral pH before the ELISA. In some experiments, supernatants for analysis of cytokines levels were collected from TRadapt cells restimulated with plate-bound anti-CD3 and anti-CD28 for 4, 8, and 24 h.
Cells were lysed in Laemmli sample buffer, loaded onto one-dimensional SDS-polyacrylamide gels (Bio-Rad), subjected to electrophoresis, and transferred onto polyvinyl difluoride membranes (Millipore) by electroblotting. The membranes were blocked for 2 h in a solution containing 25 mM Tris-HCl (pH 7.5), 150 mM NaCl, 0.05% Tween 20 plus 5% milk, and incubated with monoclonal mouse anti-human COX-2 (1/5000) (Cayman Chemical), rabbit polyclonal anti-human COX-2 (1/1000) (Santa Cruz Biotechnology), monoclonal goat anti-human FOXP3 (1/1000) (Santa Cruz Biotechnology), mouse anti-human FOXP3 (1/1000) (eBioScience), monoclonal mouse anti-human FOXP3 (1/200) (Abcam) or monoclonal mouse anti-human protein kinase C (PKC)-α (1/4000) (BD Biosciences) overnight at 4°C in blocking solution. The membranes were washed in a solution containing 25 mM Tris-HCl (pH 7.5), 150 mM NaCl, and 0.05% Tween 20. Immunoreactive proteins were visualized by SuperSignal (Pierce) using HRP-conjugated secondary Abs and subjected to autoradiography. Cells were washed in PBS, fixed in 1% paraformaldehyde, and permeabilized in FACS Permeabilizing Solution (BD Biosciences) for 10 min before staining with CD8 allophycocyanin, CD3 PerCP, CD25 PE, COX-2 FITC, or IFN-γ PE (BD Biosciences; BD Biosciences Pharmingen). The cells were washed once in PBS containing 1% BSA and fixed in 1% paraformaldehyde before being acquired on a flow cytometer (FACSCalibur; BD Biosciences) and analyzed using FlowJo software (Tree Star). Purified CD4+CD25− T cells (1 × 105) were stimulated with soluble anti-CD3 (5.0 μg/ml) and anti-CD28 (0.5 μg/ml) in the absence or presence of TRadapt cells at a 3:1 ratio. The cells were cultured at 37°C in 5% CO2 for 6 days and pulsed with 5 μCi of [methyl-3H]thymidine for the last 16–18 h, harvested onto filters, and counted in a beta scintillation counter. CD25− T cells were resuspended at a concentration of 1 × 107 cells/ml RPMI 1640 and labeled with 2 mM CFSE for 10 min at 37°C. Labeling was quenched with complete medium, and the cells were washed twice before stimulation with 2.5 mg/ml SEB for 4 days. The cells were fixed, stained for cell surface factors, and analyzed by flow cytometry as described. Transwell experiments were conducted in 24-well plates (1 ml/well) with 2 × 105 effector cells, APC, and SEB in the absence or presence of 2 × 105 TRadapt cells added directly to the culture or to the Transwell inserts (pore size, 3.0 μm; Nunc). TR cells were added in increasing ratios to autologous PBMC depleted of CD25+ T cells to a total of 2 × 105 cells and stimulated with 10 μg/ml SEB (Sigma-Aldrich) for 20 h. Brefeldin A (Sigma-Aldrich) was added at a final concentration of 5 μM for the last 5 h of the incubation period to promote cytokine accumulation. In all coculture experiments, TR cells were stained with 2 μM CFSE for 5 min at 37°C, to allow separate flow cytometric analysis of the TR cells and the responding effector T cells. The cells were fixed, permeabilized, stained for cell surface factors and intracellular IFN-γ, and analyzed by flow cytometry as described. T cells (1.5 × 106) were left untreated or treated with increasing concentrations of agonist for 1.5 min in stimulation buffer with the nonspecific phosphodiesterase inhibitor 3-isobutyl-1-methylxanthine (IBMX). Concentrations of cAMP were assessed by a plate-based radioimmunoassay according to the manufacturer’s instructions (PerkinElmer Life and Analytical Sciences). The adenylyl cyclase activator forskolin (Sigma-Aldrich) was used as positive control. For real-time quantitative PCR analysis of FOXP3, COX-2, and β-actin, total RNA was extracted using an RNeasy Mini Spin Kit (Qiagen) according to the manufacturer’s instructions, and cDNA was prepared using the iScript cDNA Synthesis Kit (Bio-Rad) according to the manufacturer’s manual. Message levels were quantified by real-time PCR using the iCycler iQ Real-Time PCR Detection System (Bio-Rad). Amplification reactions were performed in a 96-well plate in a total volume of 25 μl/well consisting of 300 nM forward and 300 nM reverse primers specific for FOXP3 (forward, 5′-GAA ACA GCA CAT TCC CAG AGT TC-3′; reverse, 5′-ATG GCC CAG CGG ATG AG-3′), COX-2 (forward, 5′-GCC CTT CCT CCT GTG CC-3′; reverse, 5′-AAT CAG GAA GCT GCT TTT TAC-3′), or β-actin (forward, 5′-AGG CAC CAG GGC GTG AT-3′; reverse, 5′-TCG TCC CAG TTG GTG ACG AT-3′). PCR amplifications consisted of 45 cycles of denaturation at 95°C for 15 s and annealing and extension at 60°C for 1 min, and target product was detected using SYBR Green I dye (iQ SYBR Green Supermix; Bio-Rad). β-Actin was used as a reference housekeeping gene for all samples. All samples were run in triplicate, standard curves were run on the same plate, and the relative standard curve method was used for calculation of relative gene expression. Relative expression was determined by normalizing the expression of each target to β-actin, and then comparing this normalized value to the normalized expression in a reference sample to calculate a fold-change value. Several ex vivo and in vivo experimental models for induction of suppressive CD4+ T cells from CD25− T cells have been described. Generation of TR1 cells that produce large amounts of IL-10 can be induced by repetitive or sustained stimulation of CD4+CD25− T cells ex vivo in the presence of IL-10 (11, 38). IL-10-producing TR cells can also be induced in culture by the presence of vitamin D3 and dexamethasone (39), and TGF-β-producing Th3 cells are generated during induction of oral tolerance to self-Ags (9). We have generated a model for induction of TRadapt cells from CD4+CD25− T cells by prolonged in vitro stimulation of PBMC depleted of CD25+ T cells with SEB or stimulation of purified CD4+CD25− T cells with anti-CD3/anti-CD28 for 4–7 days (Ref. 40 and Fig. 1⇓). T cells start to express CD25 within the first 24 h when they are activated, and after 4 days in culture 40–80% of the CD4+ T cells expressed CD25 at equal levels as TRnat cells (Fig. 1⇓A). We then isolated the CD4+CD25+ T cells and compared the FOXP3 protein expression by Western blot analysis with that of TRnat cells and CD4+CD25− T cells from autologous donors (Fig. 1⇓B). FOXP3 was expressed at equal levels in the induced CD4+CD25+ T cells and the TRnat cells, but was not expressed in the CD4+CD25− T cells. This is in line with recent publications that have demonstrated induction of FOXP3 in TRadapt cells that have been induced from CD4+CD25− T cells using other experimental systems (16, 17, 18, 19, 20). Suppressive CD4+CD25+ T cells (TRadapt cells) can be induced from CD4+CD25− T cells. A, CD25 expression on CD4+ T cells analyzed by flow cytometry in PBMC depleted of CD25+ cells at day 0 and after SEB stimulation for 4 days. B, Western blot analysis of FOXP3 protein levels in TRnat cells, CD4+CD25− T cells, and CD4+CD25+ T cells induced by SEB stimulation for 4 days as in A. A PKC-α blot was used as loading control. C and D, TRadapt cells were added at increasing ratios to autologous CD4+CD25− T cells. SEB-induced T cell proliferation in PBMC depleted of CD25+ cells was assessed by CFSE proliferation assay (C). Anti-CD3/anti-CD28-induced T cell proliferation was assessed by [3H]thymidine incorporation (triplicates, mean ± SEM) (D). E, Anti-CD3/anti-CD28-induced T cell proliferation as described above (left) or SEB-induced IFN-γ expression in CD4+ T cells in PMBC depleted of CD25+ cells (right) with or without of TRnat cells or TRadapt cells from autologous donors (triplicates, mean ± SEM). To assess the inhibitory capacity of the induced FOXP3+CD4+CD25+ T cells, we compared the SEB-induced proliferation of T cells in PBMC depleted of CD25+ cells in the presence and absence of induced CD4+CD25+ T cells from autologous donors (Fig. 1⇑C). The CD4+CD25+ T cells were induced by in vitro stimulation for 4–7 days. In the coculturing experiments, the CD4+CD25+ T cells suppressed T cell proliferation in a concentration-dependent manner. 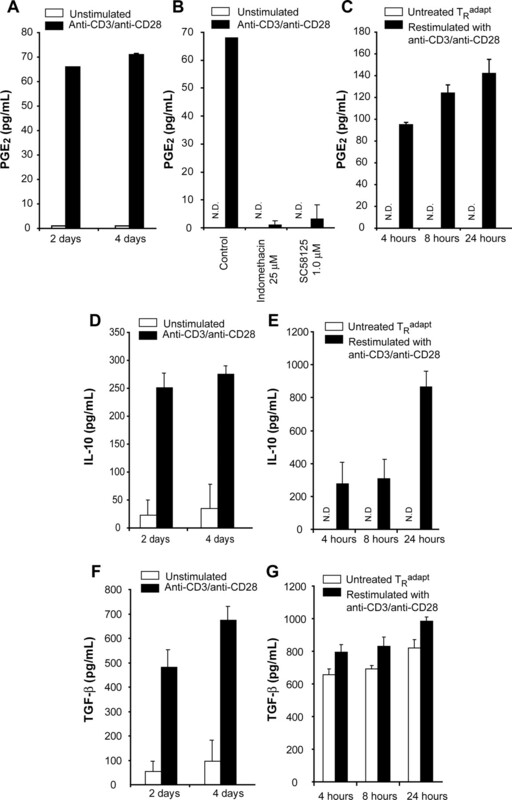 Similar results were obtained with anti-CD3/anti-CD28-induced proliferation of purified CD4+CD25− T cells measured by [3H]thymidine incorporation (Fig. 1⇑D). The inhibitory capacity of the induced CD4+CD25+ T cells was within the same range as that of TRnat cells from the autologous donor (Fig. 1⇑E, left panel). Furthermore, similar to what we observed with inhibition of proliferation, the induced CD4+CD25+ T cells suppressed IFN-γ expression in CD4+ T cells in PBMC from the autologous donors to the same extent as did the TRnat cells (Fig. 1⇑E, right panel). The method of stimulation with either SEB or with anti-CD3/anti-CD28 did not affect the suppressive potential of the induced CD4+CD25+ T cells. Functionally, the above defines the induced CD4+CD25+ T cells as TRadapt cells. COX-2 is primarily expressed in activated monocytes and macrophages (34). However, in the MAIDS model, which is characterized by massive immune activation due to a chronic retroviral infection, the T cells express high levels of COX-2 and produce PGE2 (30). We therefore hypothesized that COX-2 expression and production of PGE2 might represent the inhibitory mechanism of TRadapt cells induced through prolonged in vitro activation. To examine whether TRadapt cells expressed COX-2, purified CD4+CD25− T cells were stimulated with anti-CD3/anti-CD28 for a period of 2–4 days. During the period of stimulation, the CD4+CD25+ T cells started to express COX-2 (Fig. 2⇓). Interestingly, COX-2 expression was neither observed in activated TRnat cells (Fig. 2⇓B) nor resting TRnat cells (data not shown). This finding may represent an important functional difference between TRadapt cells and TRnat cells. During the differentiation process, the COX-2 expression was accompanied by PGE2 production (Fig. 3⇓A) that was completely suppressed in the presence of the COX inhibitor indomethacin and the COX-2-specific inhibitor SC58125 (Fig. 3⇓B). After 4 days of stimulation of CD4+CD25− T cells, CD4+CD25+ TRadapt cells were purified and restimulated with anti-CD3/anti-CD28 (Fig. 3⇓C). The PGE2 production was further enhanced in the culture of purified TRadapt cells. TRadapt cells express COX-2. A, PBMC was depleted of CD25+ cells and stimulated with anti-CD3/anti-CD28 for 2 days. COX-2 expression in CD3+CD4+ T cells was assessed by intracellular flow cytometry. Data from one representative experiment is shown. B, Western blot analysis of COX-2 protein levels in TRnat, untreated CD4+CD25−, and CD4+CD25− T cells (1 × 107) stimulated with anti-CD3/anti-CD28 for 2, 3, and 4 days. Untreated and LPS-stimulated CD14+ monocytes (1 × 106) were used as controls. TRadapt cells produce PGE2, IL-10, and TGF-β following stimulation with anti-CD3/anti-CD28. Concentration of PGE2 (A), IL-10 (D), and TGF-β (F) in supernatants of CD4+CD25− T cells treated with anti-CD3/anti-CD28 for 2 and 4 days. B, CD4+CD25− T cells were preincubated for 2 h with indomethacin or the COX-2 inhibitor SC58125 and stimulated with anti-CD3/anti-CD28 for 2 days as in A. Concentration of PGE2 (C), IL-10 (E), and TGF-β (G) in supernatants of purified TRadapt cells restimulated with anti-CD3/anti-CD28 for 4, 8, and 24 h. TRadapt cells were induced by stimulation of CD4+CD25− T cells for 4 days with soluble anti-CD3 (2.5 μg/ml) and anti-CD28 (0.5 μg/ml). Mean ± SEM. N.D., Not detectable. During the differentiation process, the CD4+ T cells also produced significant amounts of IL-10 and TGF-β (Fig. 3⇑, D and F). After 4 days of stimulation, the TRadapt cells were purified and restimulated with anti-CD3/anti-CD28 (Fig. 3⇑, E and G). IL-10 production peaked after 24 h (Fig. 3⇑E). In contrast to the IL-10 production, TGF-β production appeared to be independent of restimulation of the TRadapt cells (Fig. 3⇑G). PGE2 acts via a family of four G protein-coupled 7-span receptors termed EP1 to EP4. Human T cells express EP2 and EP4 receptors. To examine the immunosuppressive properties of PGE2 on CD4+ T cell function, anti-CD3/anti-CD28-induced T cell proliferation was examined in the presence and absence of exogenous PGE2 (Fig. 4⇓A, left panel). Proliferation was suppressed in a concentration-dependent manner in the responding T cells. Similar results were obtained with the EP2 receptor agonist butaprost, indicating that the suppressive properties of PGE2 are partly mediated by the EP2 receptor (Fig. 4⇓A, right panel). PGE2 and the EP2 selective agonist butaprost inhibit superantigen-induced cytokine production and increase cAMP levels in T cells. A, Anti-CD3/anti-CD28-induced T cell proliferation in the absence and presence of increasing concentrations of PGE2 or butaprost assessed by [3H]thymidine incorporation. The cells were preincubated with PGE2 or butaprost 1 h before stimulation. B, Cyclic AMP levels in T cells treated with increasing concentrations of PGE2 or butaprost for 1.5 min. C, Cyclic AMP levels in T cells preincubated for 1 h in the absence or presence of the EP2 and/or EP4 receptor antagonists AH6809 and AH23848, respectively, and stimulated with PGE2 or butaprost for 1.5 min. The adenylyl cyclase activator forskolin was used as a positive control (100 μM, 4 min). D, Cyclic AMP levels in CD4+CD25− T cells that were unstimulated or stimulated with anti-CD3/anti-CD28 in the absence or presence of indomethacin (left panel) or EP2 and/or EP4 antagonists (right panel). The cells were preincubated with inhibitors for 1 (AH6809, AH23848) or 2 (indomethacin) h followed by stimulation with anti-CD3/anti-CD28 for 3 days. At day 2, the nonselective phosphodiesterase inhibitor IBMX (200 μM) was added to the cultures to promote cAMP accumulation. E, Cyclic AMP levels measured in T cells and in purified CD4+CD25− T cells and TRadapt cells after stimulation for 3 days with anti-CD3/anti-CD28. After purification, the separate subpopulations were cultured for 4 h without any stimulation before assessment of the cAMP levels. F, Cyclic AMP levels in purified CD4+CD25− T cells incubated in medium recovered from unstimulated CD4+CD25− cells (control) or in medium recovered from TRadapt cells for 4 h in the presence of IBMX (200 μM). Mean ± SEM. Both EP2 and EP4 receptors signal through G proteins, leading to production of cAMP. As seen in Fig. 4⇑B, PGE2 and butaprost led to a concentration-dependent increase in cAMP production that was suppressed by the EP2 receptor antagonist AH6809 and the EP4 receptor antagonist AH23848 (Fig. 4⇑C). AH6809 and AH23848 had additive inhibitory effects on PGE2-induced cAMP production, whereas only AH6809 suppressed cAMP production induced by butaprost, confirming the EP2 receptor specificity of this agonist. To examine whether PGE2 produced by TRadapt cells induced cAMP production, we first stimulated CD4+CD25− T cells with anti-CD3/anti-CD28 for 3 days, and IBMX, a nonspecific cyclic nucleotide phosphodiesterase inhibitor, was added to the culture for the last 24 h to promote cAMP accumulation (Fig. 4⇑D). Cyclic AMP accumulated in the CD4+ T cells while cAMP production was suppressed in the presence of indomethacin, indicating that the cAMP production was dependent on COX activity. Similar results were obtained using AH6809 and AH23848, confirming that PGE2 is the humoral factor that drives cAMP production by an EP2/EP4 receptor-dependent mechanism. We next stimulated CD25− T cells for 3 days with anti-CD3/anti-CD28 in an identical manner as in the previous experiment, but without adding IBMX to the culture (Fig. 4⇑E). At day 3 the T cells were washed, separated into CD4+CD25− T cells and TRadapt cells, and cultured for another 4 h without any further stimulation. The cAMP levels were measured in the separate populations to examine potential autocrine or paracrine effects of PGE2. Although the intracellular cAMP levels were negligible in the unsorted T cells and CD4+CD25− T cells, there was a significant increase in the cAMP levels in the TRadapt cells, indicating cAMP production due to ongoing PGE2 production (Fig. 4⇑E). In a final experiment, the supernatant from TRadapt cells, induced from CD4+CD25− T cells with anti-CD3/anti-CD28 stimulation for 4 days, was added to unstimulated CD4+CD25− T cells. The supernatant from the TRadapt cells induced a significant increase in the level of intracellular cAMP in the T cells, whereas medium recovered from the CD4+CD25− T cells did not (Fig. 4⇑F). To examine whether immunosuppression by TRadapt cells required cellular contact, the suppressive activity of the cells was tested in a Transwell experiment. SEB-induced T cell proliferation in PBMC depleted of CD25+ cells was assessed by CFSE proliferation assay, where TRadapt cells from autologous donors were added either directly to the cultures or to the Transwell inserts (Fig. 5⇓A). The results clearly showed that TRadapt cells suppress T cell proliferation in a contact-independent manner. These results were further supported by the observation that supernatant from stimulated TRadapt cells suppressed CD4+ T cell IFN-γ expression (Fig. 5⇓B). This clearly indicates that TRadapt cells are able to suppress T cell responses by paracrine action of a humoral factor. TRadapt cells inhibit T cell immune responses by a humoral factor. A, SEB-induced T cell proliferation in PBMC depleted of CD25+ cells was assessed by CFSE proliferation assay. TRadapt cells from autologous donors were added directly to the cultures or to the Transwell inserts. Data from one representative experiment are shown (n = 3). B, IFN-γ expression in purified CD4+ T cells incubated in medium recovered from unstimulated (control) and stimulated TRadapt cells. The medium was replenished once during the incubation period with culture supernatant from TRadapt cells to limit the possible degradation of humoral factors present in the medium during the assay period. To examine the immunosuppressive role of PGE2 production by TRadapt cells, SEB-induced T cell proliferation in PBMC depleted of CD25+ cells was examined with and without addition of autologous TRadapt cells in the presence and absence of the COX inhibitor indomethacin, the COX-2-specific inhibitor SC58125, and the EP-2 and EP-4 receptor antagonists AH6809 and AH23848, respectively (Fig. 6⇓A). All agents fully or significantly reversed the immunosuppression mediated by the TRadapt cells. Similar results were obtained with anti-CD3/anti-CD28-induced T cell proliferation (Fig. 6⇓B). In similar experiments, addition of IL-2 or IL-7 did not reverse the suppressive effect of the TRadapt cells (data not shown), indicating that the activity of these cells is not dependent on IL-2 consumption, but rather represents an active mechanism that involves production and secretion of PGE2. COX inhibitors and EP2 and EP4 receptor antagonists reverse TRadapt cell-mediated suppression of T cell effector function. A, SEB-induced T cell proliferation in PBMC depleted of CD25+ cells was assessed by CFSE proliferation assay. TRadapt cells from autologous donors were added to the cultures as indicated. Cells were preincubated with the COX inhibitor indomethacin or the COX-2 inhibitor SC58125 for 24 h, or a combination of the EP2 (AH6809) and EP4 (AH2384) receptor antagonists for 1 h and during activation. B, Anti-CD3/anti-CD28-induced proliferation of CD4+CD25− T cells was assessed by [3H]thymidine incorporation. TRadapt cells from autologous donors were added to the cultures as indicated and treated with the COX-2 inhibitor SC58125 or a combination of the EP2 and EP4 receptor antagonists as in A. C, The frequency of SEB-induced IFN-γ expressing CD4+ T cells was assessed by intracellular flow cytometry in PBMC depleted of CD25+ cells. TRadapt cells from the autologous donor were added to the cultures as indicated. Indomethacin, SC58125, anti-IL-10, and anti-TGF-β (subtypes 1, 2, 3) were added before (preincubation times: 24 h for COX inhibitors, 1 h for Abs) and during activation with SEB. Mean ± SEM. We next examined SEB-induced IFN-γ expression in CD4+ T cells with and without addition of TRadapt cells in the presence and absence of indomethacin and the COX-2-specific antagonist SC58125 (Fig. 6⇑C). Indomethacin completely reversed the immunosuppression mediated by the TRadapt cells. Comparable results were obtained with SC58125. These observations suggest that the inhibitory effect of TRadapt cells is mediated by COX-2 expression and paracrine effects of PGE2. A small increase in IFN-γ expression was also observed in the control cultures (PBMC depleted of CD25+ T cells) when indomethacin and SC58125 was added. This may be due to COX-2 activity in monocytes present in the culture. Although the TRadapt cells produced IL-10 and TGF-β at high levels (Fig. 3⇑, D–G), neutralizing Abs to IL-10 and TGF-β had little or no effect on the TRadapt cell-mediated suppression of IFN-γ expression (Fig. 6⇑C) or on T cell proliferation (data not shown). We also induced TRadapt cells in the presence of anti-TGF-β; however, no effect on development or immunosuppressive properties was observed (data not shown). FOXP3 is crucial in the development and function of TRnat cells (13, 14, 15), and is also expressed in both murine and human TRadapt cells induced from CD4+CD25− T cells by continuous polyclonal stimulation or by stimulation in the presence of TGF-β (Fig. 1⇑B and Refs. 16, 17, 18). Because COX-2 expression and PGE2 production appeared to play an important role in the immunosuppressive mechanism of TRadapt cells, we examined whether PGE2 leads to FOXP3 expression. We first examined the kinetics of COX-2 and FOXP3 mRNA expression by real-time PCR during induction of TRadapt cells from CD25− T cells with SEB (Fig. 7⇓A). The kinetics of COX-2 and FOXP3 expression were nearly identical. These findings were confirmed at the protein level, where both FOXP3 and COX-2 appeared after 16–24 h of stimulation (Fig. 7⇓B). To further explore whether PGE2 induced FOXP3 mRNA expression, unstimulated CD4+CD25− T cells were cultured in the absence and presence of PGE2 or the cAMP analog 8-CPT-cAMP (Fig. 7⇓C). PGE2 led to a 3- to 5-fold induction of FOXP3 expression in a concentration-dependent manner. Furthermore, 8-CPT-cAMP induced FOXP3 expression to the same levels as PGE2. This suggests that FOXP3 expression is induced as a result of autocrine effects of PGE2 in TRadapt cells and that cAMP acts as the intracellular signal. We also evaluated the effect of TGF-β and anti-TGF-β on induction of FOXP3, either alone or in combination with PGE2. Although TGF-β induced FOXP3 expression in some experiments, presence of anti-TGF-β did not inhibit PGE2-induced FOXP3 expression (data not shown). This indicates that PGE2 is able to induce FOXP3 expression independently of TGF-β. In a final experiment, TRadapt cells were generated from CD4+CD25− T cells in the presence of indomethacin or the COX-2-specific inhibitor SC58125 (Fig. 7⇓D). Both indomethacin and SC58125 significantly suppressed FOXP3 mRNA expression. These findings suggest that PGE2 leads to FOXP3 expression in a cAMP-dependent manner in both CD25− and CD25+CD4+ T cells, and that PGE2 is an important immunosuppressive humoral factor whereby TRadapt cells suppress effector T cells (Fig. 7⇓E). Expression of FOXP3 in TRadapt cells is induced by superantigen and PGE2 and suppressed by COX inhibitors. A and B, PBMC depleted of CD25+ T cells were stimulated with SEB for indicated time periods. CD4+CD25+ T cells were purified and analyzed at each time point by real-time quantitative PCR using gene-specific primers for COX-2, FOXP3, and β-actin (A) and expression of FOXP3 and COX-2 protein by Western blot and intracellular flow cytometry (B), respectively. In real-time quantitative PCR, relative gene expression was determined by normalizing COX-2 and FOXP3 expression of each sample to β-actin. Mean ± SEM. C, Western blot analysis (bottom panel) of FOXP3 expression in CD4+CD25− T cells cultured for 2 days in the absence or presence of PGE2 or the cAMP analog 8-CPT-cAMP. The protein levels of PKC-α were used as loading control. Densitometric analysis of FOXP3 expression in Western blots was quantified by densitometric analysis and normalized to PKC-α levels (top panel; mean ± SEM; n = 5). D, CD4+CD25− T cells were stimulated by anti-CD3/anti-CD28 for 3 days in the absence or presence of the COX inhibitor indomethacin or the COX-2-specific inhibitor SC58125, CD4+CD25+ T cells were purified, and FOXP3 mRNA levels were analyzed by real-time PCR as in A. E, Schematic model that depicts the autocrine and paracrine effects of PGE2 secreted from TRadapt cells. PGE2 secreted from TRadapt cells suppress the immune activity of CD4+CD25+ effector T cells. In addition, PGE2 leads to induction of FOXP3 expression in all three subsets of CD4+ T cells in an autocrine and paracrine manner. The role of TRnat cells in normal immune control is now well established, although central questions regarding lineage relationship and mechanism of suppression of responding effector T cells remain to be answered. TRadapt cells represent a less-characterized subpopulation of suppressive CD4+ T cells that are induced in the periphery by continuous antigenic exposure. In line with this thinking, TRadapt cells may play a role to resolve an immune response once the Ag is cleared. In chronic infectious diseases, TRadapt cells may balance the immune response to limit immune-related tissue damage and at the same time achieve immune control and prevent bacterial or viral replication. Whether or not TRnat cells and TRadapt cells are generated by parallel processes taking place at different anatomical sites and share basic biological properties is a fundamental question that remains to be elucidated. TRadapt cells appear to represent a more heterogeneous subpopulation than TRnat cells, although this may relate to different experimental procedures and model systems. TRadapt cells include both IL-10-producing TR1 cells and TGF-β-producing Th3 cells (4). FOXP3 expression is essential for the immunosuppressive activity of TRnat cells (13, 14, 15). Whereas the suppressive activity of TR1 cells is independent of FOXP3 expression (41), TRadapt cells in other model systems express FOXP3 and appear to share important biological properties with TRnat cells such as IL-10/TGF-β-independent immunosuppression (16, 17, 18, 42, 43). This is consistent with our data demonstrating that the CD4+CD25− T cells started to express FOXP3 during the differentiation to TRadapt cells and that the suppressive activity was not reversed by neutralizing Abs to IL-10 or TGF-β. Although expression of FOXP3 is closely associated with the suppressive immune activity of both TRnat cells and TRadapt cells, the mechanism of suppression is not known. PGE2 has a strong inhibitory effect on mature T cells. Furthermore, recent work has demonstrated that PGE2 can increase the immunosuppressive potential of TR cells and convert CD4+CD25− T cells into T cells with a immunosuppressive phenotype by induction of FOXP3 (36, 37). These data suggest that PGE2 is able to change the phenotypic characteristics of T cells engaged in an ongoing immune response. However, it has not previously been demonstrated that TRadapt cells express COX-2 and is a source of PGE2. The conversion of CD4+CD25− T cells into COX-2-expressing TRadapt cells may reflect the phenotypic change that occurs when an immune response develops into a chronic inflammatory process. However, it is not clear whether TRadapt cells arise directly from naive CD4+CD25− cells or by a linear differentiation pathway through an intermediate effector stage (Fig. 7⇑E and Ref. 10). In addition to the paracrine suppressive effects on responding effector CD4+ T cells, PGE2 has autocrine effects as evident from increased levels of cAMP in the TRadapt cells. Thus, PGE2 acts as a humoral factor, and both the immunosuppressive effect and the increase in intracellular cAMP were reversible with COX inhibitors and EP-receptor antagonists. The paracrine effect of PGE2 was also evident from experiments in which supernatants transferred from TRadapt cells induced cAMP production and suppressed IFN-γ production in CD4+ effector T cells, and in Transwell experiments in which TRadapt cells suppressed T cell proliferation in a contact-independent manner. Although IL-10 and TGF-β were not responsible for the immunosuppressive effect of TRadapt cells in this experimental system, IL-10 and TGF-β play important roles in the differentiation and function of TR cells and may also act as immunosuppressive factors. TGF-β is important for the differentiation from naive CD4+ T cells to FOXP3+ TRadapt cells (16), and coculture of TRnat cells with CD4+ T cells leads to generation of suppressive CD4+ T cells that inhibit in a TGF-β- and/or IL-10-dependent manner in vitro (44, 45). Furthermore, IL-10 produced by TRnat cells is important for the establishment of long-term immunity in certain parasite infections by suppressing effector T cells and thereby preventing sterilizing immunity and loss of immunity to reinfection (46). Thus, IL-10 and TGF-β may play multiple roles in the differentiation and function of TRadapt cells as well as TRnat cells. The effect of PGE2 on IL-10 and TGF-β expression and secretion in TRadapt cells needs further investigation. Furthermore, yet unknown factors expressed by TRadapt cells may contribute to their regulatory function. The near identical kinetics of regulation of FOXP3 and COX-2 mRNA and protein expression was intriguing, and we hypothesized and found that FOXP3 expression was induced by COX-2 and subsequent autocrine effects of PGE2. This is in line with recent observations showing that PGE2 produced from COX-2-expressing cancer cells is involved in regulation of FOXP3 expression (36, 37, 47). Thus, FOXP3 expression appears to be a consequence of the inhibitory mechanism that operates in these cells, rather than a cause of suppressive action, and this is subject to further investigation. This finding distinguishes TRadapt cells in this system from TRnat cells, where FOXP3 is essential for the immunosuppressive capacity. In conclusion, our data demonstrate a novel mechanism of TRadapt cell-mediated immune suppression that depends on COX-2 expression and secretion of PGE2. PGE2 acts in a paracrine manner to inhibit effector T cell responses, and has autocrine effects on TRadapt cells that lead to an increase in the level of intracellular cAMP and up-regulation of FOXP3 expression. ↵1 This work was supported by grants from the National Programme for Research in Functional Genomics in Norway and a Cancer Programme grant in the Research Council of Norway, the Norwegian Cancer Society, Novo Nordic Foundation Committee, and the European Union (Research and Technological Development Grant QLK3-CT-2002-02149). ↵2 Present address: Immune and Gene Therapy Unit, Cancer Center Karolinska, Karolinska Institute, SE-171 77 Stockholm, Sweden. ↵4 Abbreviations used in this paper: TR, regulatory T; TRnat, naturally occurring TR; TRadapt, adaptive TR; MAIDS, murine acquired immunodeficiency syndrome; COX-2, cyclooxygenase type 2; SEB, staphylococcal enterotoxin B; PKC, protein kinase C; IBMX, 3-isobutyl-1-methylxanthine. Powrie, F., R. Correa-Oliveira, S. Mauze, R. L. Coffman. 1994. Regulatory interactions between CD45RBhigh and CD45RBlow CD4+ T cells are important for the balance between protective and pathogenic cell-mediated immunity. J. Exp. Med. 179: 589-600. Bluestone, J. A., A. K. Abbas. 2003. Natural versus adaptive regulatory T cells. Nat. Rev. Immunol. 3: 253-257. Knoechel, B., J. Lohr, E. Kahn, J. A. Bluestone, A. K. Abbas. 2005. Sequential development of interleukin 2-dependent effector and regulatory T cells in response to endogenous systemic antigen. J. Exp. Med. 202: 1375-1386. Yamagiwa, S., J. D. Gray, S. Hashimoto, D. A. Horwitz. 2001. A role for TGF-β in the generation and expansion of CD4+CD25+ regulatory T cells from human peripheral blood. J. Immunol. 166: 7282-7289. Curotto de Lafaille, M. A., A. C. Lino, N. Kutchukhidze, J. J. Lafaille. 2004. CD25− T cells generate CD25+Foxp3+ regulatory T cells by peripheral expansion. J. Immunol. 173: 7259-7268. Walker, M. R., D. J. Kasprowicz, V. H. Gersuk, A. Benard, L. M. Van, J. H. Buckner, S. F. Ziegler. 2003. 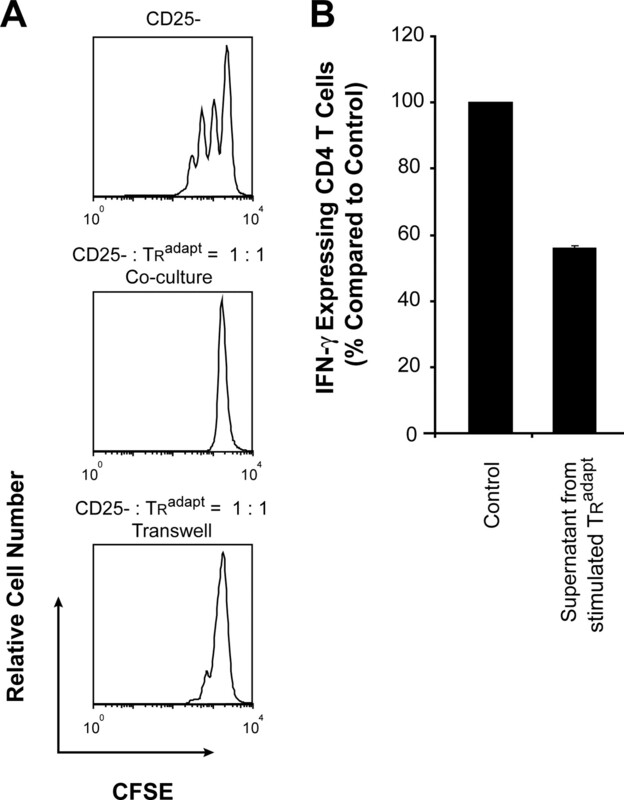 Induction of FoxP3 and acquisition of T regulatory activity by stimulated human CD4+CD25− T cells. J. Clin. Invest. 112: 1437-1443. Cobbold, S. P., R. Castejon, E. Adams, D. Zelenika, L. Graca, S. Humm, H. Waldmann. 2004. Induction of foxP3+ regulatory T cells in the periphery of T cell receptor transgenic mice tolerized to transplants. J. Immunol. 172: 6003-6010. Walker, M. R., B. D. Carson, G. T. Nepom, S. F. Ziegler, J. H. Buckner. 2005. De novo generation of antigen-specific CD4+CD25+ regulatory T cells from human CD4+CD25− cells. Proc. Natl. Acad. Sci. USA 102: 4103-4108. Tilley, S. L., T. M. Coffman, B. H. Koller. 2001. Mixed messages: modulation of inflammation and immune responses by prostaglandins and thromboxanes. J. Clin. Invest. 108: 15-23. Nataraj, C., D. W. Thomas, S. L. Tilley, M. T. Nguyen, R. Mannon, B. H. Koller, T. M. Coffman. 2001. Receptors for prostaglandin E2 that regulate cellular immune responses in the mouse. J. Clin. Invest. 108: 1229-1235. Kabashima, K., T. Saji, T. Murata, M. Nagamachi, T. Matsuoka, E. Segi, K. Tsuboi, Y. Sugimoto, T. Kobayashi, Y. Miyachi, et al 2002. The prostaglandin receptor EP4 suppresses colitis, mucosal damage and CD4 cell activation in the gut. J. Clin. Invest. 109: 883-893. Goodwin, J. S., A. D. Bankhurst, R. P. Messner. 1977. Suppression of human T-cell mitogenesis by prostaglandin: existence of a prostaglandin-producing suppressor cell. J. Exp. Med. 146: 1719-1734. Aandahl, E. M., W. J. Moretto, P. A. Haslett, T. Vang, T. Bryn, K. Tasken, D. F. Nixon. 2002. Inhibition of antigen-specific T cell proliferation and cytokine production by protein kinase A type I. J. Immunol. 169: 802-808. Breyer, R. M., C. K. Bagdassarian, S. A. Myers, M. D. Breyer. 2001. Prostanoid receptors: subtypes and signaling. Annu. Rev. Pharmacol. Toxicol. 41: 661-690. Torgersen, K. M., T. Vang, H. Abrahamsen, S. Yaqub, V. Horejsi, B. Schraven, B. Rolstad, T. Mustelin, K. Tasken. 2001. Release from tonic inhibition of T cell activation through transient displacement of C-terminal Src kinase (Csk) from lipid rafts. J. Biol. Chem. 276: 29313-29318. Vang, T., K. M. Torgersen, V. Sundvold, M. Saxena, F. O. Levy, B. S. Skalhegg, V. Hansson, T. Mustelin, K. Tasken. 2001. Activation of the COOH-terminal Src kinase (Csk) by cAMP-dependent protein kinase inhibits signaling through the T cell receptor. J. Exp. Med. 193: 497-507. Vang, T., H. Abrahamsen, S. Myklebust, V. Horejsi, K. Tasken. 2003. Combined spatial and enzymatic regulation of Csk by cAMP and protein kinase A inhibits T cell receptor signaling. J. Biol. Chem. 278: 17597-17600. Rahmouni, S., E. M. Aandahl, B. Nayjib, M. Zeddou, S. Giannini, M. Verlaet, R. Greimers, J. Boniver, K. Tasken, M. Moutschen. 2004. Cyclo-oxygenase type 2-dependent prostaglandin E2 secretion is involved in retrovirus-induced T-cell dysfunction in mice. Biochem. J. 384: 469-476. Strom, T. B., C. B. Carpenter. 1983. Prostaglandin as an effective antirejection therapy in rat renal allograft recipients. Transplantation 35: 279-281. Kamei, T., M. P. Callery, M. W. Flye. 1991. Intragraft delivery of 16, 16-dimethyl PGE2 induces donor-specific tolerance in rat cardiac allograft recipients. Transplantation 51: 242-246. Moran, M., M. F. Mozes, M. S. Maddux, S. Veremis, C. Bartkus, B. Ketel, R. Pollak, C. Wallemark, O. Jonasson. 1990. Prevention of acute graft rejection by the prostaglandin E1 analogue misoprostol in renal-transplant recipients treated with cyclosporine and prednisone. N. Engl. J. Med. 322: 1183-1188. Simmons, D. L., R. M. Botting, T. Hla. 2004. Cyclooxygenase isozymes: the biology of prostaglandin synthesis and inhibition. Pharmacol. Rev. 56: 387-437. Pablos, J. L., B. Santiago, P. E. Carreira, M. Galindo, J. J. Gomez-Reino. 1999. Cyclooxygenase-1 and -2 are expressed by human T cells. Clin. Exp. Immunol. 115: 86-90. Baratelli, F., Y. Lin, L. Zhu, S. C. Yang, N. Heuze-Vourc’h, G. Zeng, K. Reckamp, M. Dohadwala, S. Sharma, S. M. Dubinett. 2005. Prostaglandin E2 induces FOXP3 gene expression and T regulatory cell function in human CD4+ T cells. J. Immunol. 175: 1483-1490. Sharma, S., S. C. Yang, L. Zhu, K. Reckamp, B. Gardner, F. Baratelli, M. Huang, R. K. Batra, S. M. Dubinett. 2005. Tumor cyclooxygenase-2/prostaglandin E2-dependent promotion of FOXP3 expression and CD4+CD25+ T regulatory cell activities in lung cancer. Cancer Res. 65: 5211-5220. Barrat, F. J., D. J. Cua, A. Boonstra, D. F. Richards, C. Crain, H. F. Savelkoul, R. de Waal-Malefyt, R. L. Coffman, C. M. Hawrylowicz, A. O’Garra. 2002. In vitro generation of interleukin 10-producing regulatory CD4+ T cells is induced by immunosuppressive drugs and inhibited by T helper type 1 (Th1)- and Th2-inducing cytokines. J. Exp. Med. 195: 603-616. Aandahl, E. M., J. Michaelsson, W. J. Moretto, F. M. Hecht, D. F. Nixon. 2004. 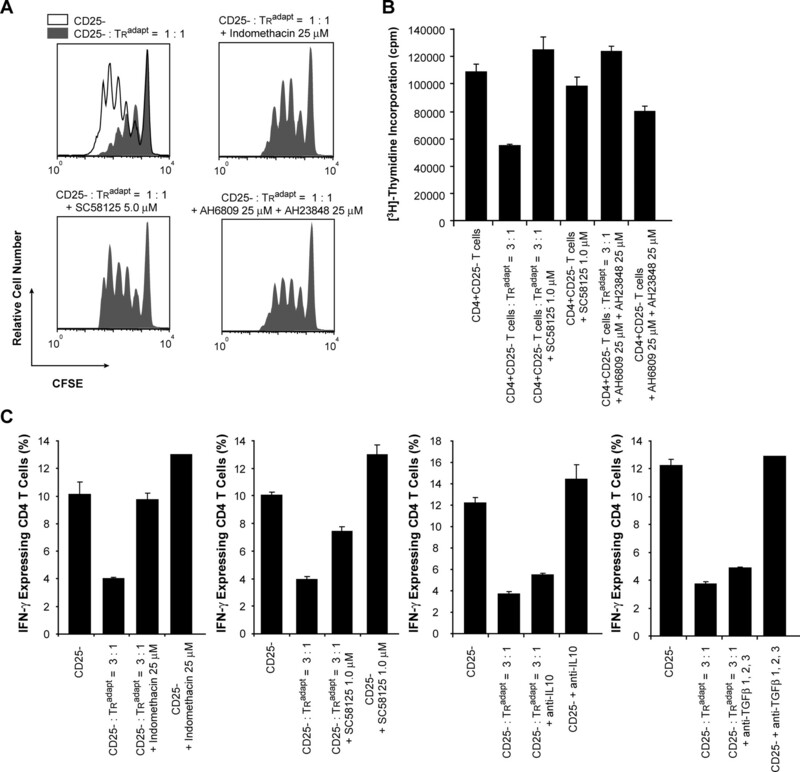 Human CD4+CD25+ regulatory T cells control T-cell responses to human immunodeficiency virus and cytomegalovirus antigens. J. Virol. 78: 2454-2459. Vieira, P. L., J. R. Christensen, S. Minaee, E. J. O’Neill, F. J. Barrat, A. Boonstra, T. Barthlott, B. Stockinger, D. C. Wraith, A. O’Garra. 2004. IL-10-secreting regulatory T cells do not express Foxp3 but have comparable regulatory function to naturally occurring CD4+CD25+ regulatory T cells. J. Immunol. 172: 5986-5993. Liang, S., P. Alard, Y. Zhao, S. Parnell, S. L. Clark, M. M. Kosiewicz. 2005. Conversion of CD4+CD25− cells into CD4+CD25+ regulatory T cells in vivo requires B7 costimulation, but not the thymus. J. Exp. Med. 201: 127-137. Jonuleit, H., E. Schmitt, H. Kakirman, M. Stassen, J. Knop, A. H. Enk. 2002. Infectious tolerance: human CD25+ regulatory T cells convey suppressor activity to conventional CD4+ T helper cells. J. Exp. Med. 196: 255-260. Dieckmann, D., C. H. Bruett, H. Ploettner, M. B. Lutz, G. Schuler. 2002. Human CD4+CD25+ regulatory, contact-dependent T cells induce interleukin 10-producing, contact-independent type 1-like regulatory T cells. J. Exp. Med. 196: 247-253. Akasaki, Y., G. Liu, N. H. Chung, M. Ehtesham, K. L. Black, J. S. Yu. 2004. Induction of a CD4+ T regulatory type 1 response by cyclooxygenase-2-overexpressing glioma. J. Immunol. 173: 4352-4359.